Babaeng Impakta is another classic Golden Age Darna villainess that was updated in the 2009 GMA series. Like many of the Darna villainesses, she has a complex and tragic origin. Throughout this text, I refer to “Impy” as an “it” rather than a “her.” It refers to itself once as an “uncle,” and it’s portrayed by a male actor, but it actually makes sense as Roma’s conjoined twin to be female. It seems likely it never truly developed a gender identity. Her name doesn’t translate easily into English. Typically “Babaeng” is woman or lady. ”Impakta” doesn’t have a direct translation but can mean a demon (usually taken as an Imp), a demonic force, one who uses magic and consorts with such forces, or more generically a “monster”. So other English translations could be as follows: Lady Imp, Imp Woman, Evil Woman, Demon Woman, Woman Monster, or any other such combination. I personally like Lady Imp, since it seems true to the origin and since the character is both a Lady and the Imp on her back. Other Aliases: The Evil Woman, The Demon Woman. Group Affiliation: Unnamed group of villainesses opposing Darna. Base Of Operations: San Martin, Philippines (filmed in Plaridel, in the province of Bulacan). Other distinguishing features: Roma originally had a hunched back that turned out to be Impy. After she was burned at the stake, Roma had burns covering half her face. Babaeng Impakta is actually a pair of conjoined twins. While the main “host,” Roma, appears relatively normal, she possesses a unique physiology and can take a terrific amount of punishment for a young woman her size and age. Also, both twins feel the pain and wounds of the other, even when they’re separated. Finally, neither twin can die while the other is still alive. Impy, the demonic conjoined twin, seems to have additional abilities over its sister when they’ve been separated, and in some ways is even more dangerous on its own. It can attach itself to others and hide in their flesh. Once bound to someone, it senses the emotions of its host and influences their thinking with its hypnotic whispering, encouraging them to do the evil things they want to do. When combined with another victim, it can still protrude from their back to make use of its tentacle like limbs and claws, but is not as physically powerful as when combined with its sister. When combined, Babaeng Impakta is in her most powerful physical form. She can stretch the Imp’s limbs like clawed tentacles across the width of a road. Deceptively strong and tough, she has been known to lift motorcycles and hurl them at her victims or to rip open several men at a time with ease. She often removes her victims’ hearts to feed the Imp. Most impressively, she has been able to face off with Darna for short amounts of time. Their abilities seem to be mystical in nature, and almost assuredly were in the original comic book version of the character. In the comic version, Impy was eventually killed using Holy Water, however in the show Impy is unaffected by it. In this version, there certainly seems to be some hereditary and biological aspect to their abilities as well. Dr. Morgan studied the twins and Roma’s baby, and even used their blood to create some serums with special properties. Roma was born to a privileged family in the 20s. While pregnant, her mother loved to stare at pictures of angels, enchanted with their beauty and power. She even looked at pictures of Lucifer in his form of the most beautiful angel, although she was afraid of his stature as the devil. Once born, Roma was a sweet girl with an angelic face, but her back was grotesquely humped. When her family took her to the church, she had a violent reaction and fell to the floor in what seemed like an epileptic fit. Some said she was possessed. When her parents sent for a priest, her hump revealed itself as a demonic looking conjoined twin which emerged from her skin. It had somehow survived being absorbed in the womb. Her family recoiled, truly thinking it some sort of devil. Ashamed, they hid it from the outside world. Roma kept her deformity as secret as possible, but her twin proved mischievous. One day when a bully was making fun of Roma and she became angry, the impish twin showed itself and scared the other children. It discovered great joy in frightening others. As the children’s chiding continued, her twin’s heart became dark and twisted. Impy, as Roma called it, started whispering to her and trying to convince her to do evil, vengeful things. It would come out whenever Roma was angry or frightened and take control. For many years she was able to contain her demonic twin’s urgings. However, shortly after marrying, she discovered her groom was cheating on her and had married her just for her money. Impy fueled her jealousy with its whispers, taking control of their union. Under the control of the demonic twin, she murdered them both in a jealous rage. Babaeng Impakta, as the public called her, went on a killing spree. Impy developed a taste for human flesh, often taking the victims’ hearts and eating them. Babaeng Impakta teamed up with other villainesses pitted against the heroine Darna. They went on a rampage, nearly defeating her by catching her in her mortal form (presumably also named Narda) before she could transform. Darna was forced into revealing the secret of how she becomes Darna, swallowing the stone in front of them. Darna managed to somehow freeze them all in a block of ice in the ocean that would contain them for nearly 6 decades. In 2009, a tsunami washed four of the villainesses in ice ashore. They were taken by scientists under the leadership of Dr. Morgan. He wanted to study them and determine if there was something in their DNA that could give powers to normal people. The scientists were surprised to find the women were still alive. The villainesses soon thawed out and escaped. Babaeng Impakta was the first to be freed. She had absorbed Darna’s flight. She began another murder spree, killing several men and leaving them at the base of a statue of Darna in the middle of town. She was soon confronted with the new Darna, and had several battles. On the advice of the Keeper, Darna managed to split the Imp from Roma in an effort to depower them. Darna continued to fight the Imp while Roma wandered off, stunned and injured. Impy was quickly defeated by Darna who took back her ability of flight, however Impy escaped. Eating small animals for survival, Impy sought a new host it could corrupt. Eventually it came across a young, rich, man named Eduardo, who was embroiled in a love triangle between himself, Narda (secretly Darna’s mortal host, who could not fall in love since it might conflict with her being Darna), and Valentina (who was secretly a gorgon-like serpent queen who hid her snakes under a wig). Impy fed Eduardo’s obsession with Narda, even though she had turned him down. Impy slowly drove him into attacking Narda, preying on his feelings of rejection. However, seeing Narda in pain, he managed to come to his senses and shook Impy off by slamming himself back first into a tree. Impy scuttled off and hid in the orphanage, where Narda lived and taught in. Its next victim was Ms. Perfecta, the headmistress of the orphanage. Whispering to her how unruly the orphans were, it convinced her that they needed to be punished. She set fire to the orphanage, and Darna arrived to save them. Darna talked Ms. Perfecta into resisting. When the burning roof started to cave in, Impy let her go and ran off again. Next, Impy found a young homeless boy named Carding. It bound itself to him, convincing him to punish the people who had refused to share food with him. Darna once again arrived on the scene and forcibly separated the two, saving the boy and his would-be victims. Narda then took him to the orphanage. Meanwhile, Roma was discovered by a young journalist named Gabriel who took her for medical attention. Once she had recovered, he asked Father Mateo, the priest who had raised him, to take her in. Soon she and Gabriel fell in love, although Roma was wracked with guilt over her violent past. She soon realized Impy was still alive, and her dread that the Imp would return mounted. Roma had felt the pain of the Imp’s fights and determined that if one died, so would the other. Roma tried running away with Gabriel to Manila so she could get away from her twin. Impy caught them and attacked, knocking Gabriel out. Roma threatened to kill herself if Impy killed him, and the demon retreated. Narda witnessed the attack and helped Roma get Gabriel to the hospital. Afterward, Roma confided in Narda about her past, entrusting her with that secret. Unfortunately, Valentina overheard Roma and Narda talking, and told Gabriel Roma’s story. When asked who she was, she gave him the name “Narda,” hoping that a vengeful Babaeng Impakta would kill her rival for Eduardo’s affections. Impy found Roma at the church, but could not enter either due to its demonic nature, or to trick Roma. Roma decided the only way she could truly be free was if she could manage to kill Impy. Taking holy water, she snuck out that night to confront her twin. Gabriel followed unobserved. He witnessed their meeting and took several pictures. The holy water at first seemed to burn Impy, but it started laughing and revealed it had been a joke. It saw Gabriel and threatened to kill him, reminding Roma that men would break her heart. She begged Impy to spare him, and in return she would bind with her twin once more. The newly reunited Babaeng Impakta tracked down Narda and accused her of revealing Roma’s secret. Narda hit them with her crutch and managed to hide behind a tree long enough to transform into Darna. The twins crept around the tree, to pounce on Narda. Instead, they found Darna ready for them. She knocked them across the field and followed to where they fell. Focused on Roma, Darna didn’t notice Impy until he climbed on her back. Darna struggled with the imp, trying to pull it off of her. Seeing that any injury she inflicted on the imp also harmed Roma, Darna held back. Carding soon approached, looking for Narda. To avoid getting him involved, Darna flew into the air. Impy whispered to Darna, talking about how useless people were and how they only liked her because she was defending them. He pointed out that when she had been hurt, none of them tried to help her. Slowly, he started to exert his influence over Darna. The Keeper of the Stone appeared to Darna, reminding her of who she was. Darna once again tried to fling the Imp from her back. In the struggle, Darna fell down to the ground where people were gathering for church. They gathered around her fallen form, wondering what was wrong. The stunned Darna recovered with Impy still whispering in her head. The first thing she saw as she came to consciousness was Valentina with Eduardo standing over her. The Imp emerged from her back, scaring the people. Upon seeing Impy, some of the people cried out, “Babaeng Impakta!” Impy continued whispering, talking about how they were calling her evil after all she’d done to defend them. She was so powerful; she could do anything she wanted. Carding realized what was going on, and encouraged Darna to fight it. The Imp’s long arm reached out to slap him away. Then it grabbed Eduardo, choking him. Valentina interceded, and with superhuman strength broke the Imp’s hold on Eduardo. Darna grabbed Valentina and flew into the courtyard behind the church, tossing her against a wall. Police tried to shoot Darna but she took their guns with Impy’s long arms. Meanwhile, Roma had freed her mind of Impy’s control. She came to the church looking for Darna and Impy, but encountered Gabriel instead. Gabriel accused her of taking control of Darna and told her she was no different from her twin, even though he had told her repeatedly in the past that he would accept her, whatever secrets she had. Even Father Mateo had pointed out to him in their previous conversations that Roma had saved him from Impy twice. As Darna stood over Valentina, ready to finish her off, the Keeper of the Stone appeared to her again, encouraging her to fight the imp. Bolstered, she ripped the imp off her back and killed it with a pitchfork. Roma, broken hearted, fled into the woods. Crying because she didn’t want to be evil, but not able to be good, she wished to die. She arrived at a strange cave as she collapsed from feeling Impy’s death. She was taken into the cave by a snake-like being called Kobra. He was secretly Valentina’s father, but she was not fulfilling his plans of bearing more of their race. Upon seeing Roma and realizing she possessed a unique physiology, he was convinced she would bear a more suitable heir to him. Dr. Morgan had one of his underlings bribe the police to release the Imp’s body to him, so he could continue studying it. Soon after he started examining it, its heart started once again and it eventually recovered. He rejoiced at getting a live specimen for his research, and took several tissue and blood samples. With no memory of her encounter with Kobra, Roma awoke and made her way back to the church. Meanwhile, her secret had been published by the town newspaper. Gabriel had confided in one of his coworkers, and gave that coworker the pictures he had taken to be destroyed. He regretted his accusations and still loved Roma, but couldn’t bear to look at the pictures. Their editor overheard the conversation and convinced the coworker to give him the pictures for publication. Enraged by the article, the townspeople came to the church, looking for Roma. Father Mateo tried to hide Roma, but she was discovered and an angry mob took her outside to burn her at the stake. One particularly vicious woman whose husband had been killed burned her face with a torch. Gabriel and Father Mateo both tried to intervene with the crowd to no avail. Darna flew in and managed to subdue the crowd until the police arrived. After watching Darna fly away, everyone turned to see Roma had disappeared. Apollo, one of Dr. Morgan’s henchmen, had taken her to the laboratory where Impy was contained. They examined her, and soon discovered that she was pregnant. At first, Roma was happy, thinking it was Gabriel’s baby. But the pregnancy developed at an astonishing rate and she gave birth within days. The baby appeared to be normal, until the child turned into a snake every time she was hungry. The doctors started making serums from her blood to conduct experiments with, and injected the serum into several frogs. Roma realized she and her baby were merely experiments to these doctors. She took her baby and fled, with the help of dozens of snakes that suddenly appeared in the lab. Apollo inadvertently freed Impy while trying to stop Roma. Impy wrecked the lab and escaped as well. Roma took the baby to Father Mateo, asking him to care for her child. She returned to the woods and rejoined with Impy. She had grown tired of the villagers accusing her of being a monster, while she had tried so hard to be a good person. Together, they went on yet another rampage through the town, killing dozens. Darna arrived and confronted Roma, who begged Darna to kill her. She believed this was the only way to stop the imp once and for all. Meanwhile, Impy threw a child from the top of a building, forcing Darna to rush off to save her. Roma climbed the bell tower of the church. Many of the villagers encouraged her to jump, but Gabriel joined the crowd and begged her to come down. She threw herself from the bell tower, and Darna arrived with a dying Impy as well. Roma made a last request of Darna that she fly her into the clouds so she could ask God’s forgiveness in heaven as she died. The twins are two sides of the same coin. Roma (named for Rome, the holy city) is a lovely woman with an angelic face. Father Mateo makes a reference to her when he says he collects angels, and Gabriel often talks about her being as beautiful as an angel. She often smiles innocently and people easily trust her big, expressive brown eyes. Impy is short, squat and looks like its demonic namesake. It has dark brown skin, pointed ears and sharp teeth. Its deformed hands bear only three elongated, clawed fingers. One could easily mistake it for a demonic goblin rather than anything related to humanity. The tragedy of Babaeng Impakta is that Roma is not truly an evil person. Once she’s away from the influence of her twin, she repents and desperately tries to redeem herself. Somewhat naïve, she is easily manipulated and can be temperamental when wronged. She sometimes jumps to conclusions, allowing Impy to take control when angry. Ultimately a martyr, Roma sacrifices herself to rid the world of her evil twin. Impy, as the name suggests, is a manipulative little mischief maker. It tries to convince any of its hosts (especially Roma) that only it loves them and they should listen because everyone else is against them. It takes advantage of any insecurity and seems to unerringly sense when it has hit a button. Impy taunts and annoys those not under its influence, often distracting them with its shrill laugh. It loves sarcasm and often refers to itself as the “beautiful twin” and to Roma as the “ugly sister.” However mischievous Impy may seem at first, its heart is as black as coal and it enjoys inflicting pain, chaos, and ultimately death upon others. The Babaeng Impakta would make a great villainess for any of the DC mystic heroes. For the most part, Roma is an innocent being manipulated and exploited by the devil literally on her back. Constantine would easily be drawn to Roma’s angelic face as well as her plight. He would be tempted by Roma’s innocence and hunting her demon unaware that the twin is a physical being inside her. Any failure on his part would, of course, result in an untold amount of guilt borne on Constantine’s shoulders. A young Tim Hunter could easily be manipulated by such a creature as well. Distracted by Roma, he might even prove tempting as a potential host for Impy. Considering Tim’s many teenage insecurities, Impy would find fertile ground for his influences. An encounter with Roma and Impy might be just the thing to help young Tim prevent himself from falling victim to the imp from the future, Barbatos. If you prefer to use her in a less mystical fashion, she’d work well in any of the rogues’ galleries where the hero is as much trying to save the soul of his opponent as well as their victims. One of the conundrums of fighting the Babaeng Impakta is whether it is possible to save Roma from Impy as well as saving their victims. Roma might even make an excellent love interest before the hero discovers her twin’s existence. In particular, Impy bears a vague resemblance to Man-Bat (without the wings). Perhaps Roma’s mother became exposed to a predecessor of the same serum during her pregnancy. While she was unaffected, her unborn fetus split creating one bat-like twin and one normal twin, rather than the periodic transformation the Man-Bat experiences. The original extract isn’t really from a bat, but instead one of the legendary flying creatures from the Philippines like the Tik Tik or the Wak Wak. If you leave Babaeng Impakta’s original timeline in tact, perhaps it was news clippings or blood samples from the original case of Babaeng Impakta that somehow gave Dr. Langstrom the idea, and the base enzyme for his extract. Langstrom may have encountered these stories during his graduate work while studying bats in the Philippines. Even if Impy has mystical components to its abilities, it’s quite possible that the twins are also mutants. Roma’s child grows incredibly quickly, which was not the case with Kobra’s other child, Valentina. This suggests there’s something special about Roma’s physiology which may be why such supernatural forces took an interest in the first place. With that in mind, Babaeng Impakta might join the Brotherhood or otherwise get affected by the various mutant events, and her mystical qualities might prevent the removal of her powers by the Scarlet Witch’s spell. Roma would work well as a thrall of Mister Sinister, with her child being an experiment of his. Considering most geneticists like to study twins, it would make perfect sense that he (and Moira MacTaggert for that matter) would find the twins and their differences fascinating. Any encounter with Roma should cause the heroes to at first think she is a victim, only to be attacked by the Babaeng Impakta controlled by Impy the moment they do anything to hurt Roma’s feelings. 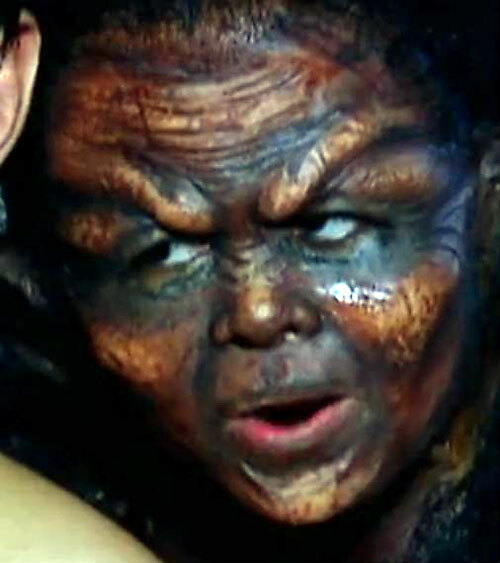 In Filipino mythology there is a creature known as a Tiyanak. It resembles a demonic baby. Sometimes it is described as a demon that takes the form of a baby and at others as the wraith of an aborted or abandoned baby. It seems likely that Impy was inspired by this myth to a great extent. It could be a fetus that was going to be absorbed by its sister, dying in the womb. Impy’s consciousness may have been approached by a devil, giving it the opportunity to sell its soul in return for a chance at life. Much like other Filipino heroes and villains, Babeng Impakta could be dropped into pretty much any comic universe as is. Most of the main comic companies sparsely populate Southeast Asia, and her back story is relatively self-contained. Suspension is automatically activated when Babaeng Impakta’s Current BODY drops to 0 or below due to damage from cold. Joined is the attachment of the twins to one another, rather than the ground and adds to the RV of such an attack. RAPs from an attack to separate them do damage the twins (any existing damage is distributed between the two as determined by the twins). Language (Tagalog, English), Rich Family (in the 1940s), Attractive. Babaeng Linta (High), Babaeng Lawin (High), Babaeng Tuod (High). The villainesses in the Darna series are frozen sometime in the 40s and are thawed out at least 60 years later with no apparent aging or negative effects, hence the Suspension power. Babeng Impakta may also be able to use this power when near death to seem dead considering the number of times she is “killed” in the series and later revived, but this may also be more of a genre convention. One aspect of the Imp that’s left for the audience to decide is whether or not the Imp is truly demonic, or just horribly deformed (possibly some sort of mutant). Presuming it’s the former; all powers are supernatural and should be Mystic Linked. I’ve given Invulnerability to their individual forms since there are several times in the series where one or the other is killed (killing the twin due to their unusual Drawback causing them to feel the damage their twin takes). Inevitably, both recover from “death” after someone attempts to revive one of the twins. There are lots of explanations around each individual occurrence, usually revolving around the person in question taking credit for the resuscitation. After several such occurrences, the simplest explanation is that this is part of their connection. They were killed once and for all when they both were killed at the same time. It certainly seems true that if one of them is resurrected, the other’s Invulnerability kicks in and they return to life as well. During one battle Babaeng Impakta also had Flight: 10. This was a power “stolen” from Darna. Babaeng Impakta lost it after the battle when she was defeated by Darna. Babaeng Impakta is actually two beings who come together to form a composite being. They are physically less powerful when separated, but they still pose problems on their own. Invulnerability only functions at or after the point of death and if her twin is alive. This is a delayed effect that usually comes about when someone attempts to revive or stabilize her. Language (Tagalog- native, English), Rich Family (in the 40s), Attractive, Schtick (The Corsican Effect). Father Mateo (High), Gabriel (High), Narda Arcanghel (Low). Creepy Appearance (after having half her face burned), Guilt, Mistrust (once the town finds out she is the Impakta’s twin). Empathy, Hypnosis and Control only work on the person whose back Impy is riding on (grappled or Joined). Empathy always works with Roma. When Control is active, the victim’s eyes turn white. Control is Serious Marginal. Impy usually relies on hypnotizing its victims rather than outright control. Joined binds Impy to people rather than the ground. It only works while the host is hypnotized or willing. Otherwise, it’s just grappling their back. As an odd bonus, Impy can absorb into their back, effectively hiding its existence and allowing the person to go around without anyone knowing they are under the influence of the imp. It’s highly difficult (8/8 while clothed, 4/4 if observer can see the victim’s skin) for anyone to detect Impy in this state. While any hypnotic suggestions or Control remain in play in this state, Impy can not use any of its Powers, including giving new suggestions, unless it visibly manifests on the back of its host. Invulnerability only functions at or after the point of death and if its twin is alive. This is a delayed effect that usually comes about when someone attempts to revive it. Stretching is limited to Impy’s Extra Limbs. Impy can only use its Extra Limb(s) to full effectiveness when attached to a host. On its own, its limbs are normal Str (03) and can not Stretch. Shrinking is Always on and Innate. Language (Tagalog- native, English), Scholar (Roma’s desires and insecurities), Schtick (The Corsican Effect). Misc (not able to physically enter a church), Strange Appearance. Description: This schtick allows a pair of people to feel what one another is experiencing physically, especially pain. When one twin takes damage, the other feels it and can even be harmed. While this effect is usually associated with twins, it could represent any pair of people who have somehow become linked in life and death. In game terms any time one of them takes damage, the RAPs are distributed between the twins. If the twins are not being controlled by the same player, it is up to the GM whether this damage is distributed evenly or if the player being attacked chooses how to distribute RAPs. The latter case can also be used to represent cases where a twin never takes their own damage and instead is only harmed when their twin is attacked (presuming the player is handing off all the damage they take to the other character). Source of Character: Darna 2009 GMA TV series, character portrayed by Nadine Samonte. Writeup completed on the 7th of January, 2013.